Let’s be honest. Busy workdays are predestined for grabbing fast food right around the corner during lunch break. And why not? You’re in a hurry, deadlines need to be met, meetings are waiting. It’s easy and convenient. Well, there is at least one downside: opting for fast food too often prevents your body to get the nutrients it needs! Although active work schedules make us choose processed food far more often, we can easily avoid unhealthy food choices by a quick home meal preparation beforehand. I promise that after reading these 5 easy meal prep ideas you won’t have a reason not to prepare a tasty and healthy meal that will make you stand out and feel good at the same time! Invest a couple of minutes into a quick and easy meal preparation and your body will thank you! Vibrant colors and vitamins! The quick preparation of veggies in a mason jar is not only trendy, but the best way to provide your body with all the minerals and dietary fiber it needs. You can even include whole-grain pasta for some extra carb energy or nuts for some antioxidant power! Start with a home-made olive oil-vinegar-dressing at the bottom, a layer of full-flavored, fresh low-carb veggies like broccoli, zucchini, spinach or avocado and top it off with some aromatic herbs! The classic! You really can’t go wrong with this one and there is a sheer endless variation of tastes and ingredients. This nutritious allrounder combines everything you need to support a balanced diet, especially when it is prepared with fresh ingredients. Try to use fresh lettuce, tomatoes or boiled eggs, and tasty hummus or avocado spread as a base. You can opt for the vegetarian version, or for those who don’t want to do without, add some ham or chicken to it. Whole-grain bread makes the package complete! The sandwich with the exotic touch! In case you need some variation, this sandwich will be perfect for you if you prefer having a low carb meal. Use all the great ingredients you would use in a classic sandwich or give it a twist by adding some tuna, feta cheese, corn, peppers, etc. Wrap it up and quickly roast each side in a pan to make it even more exotic by adding a golden brown touch to it. 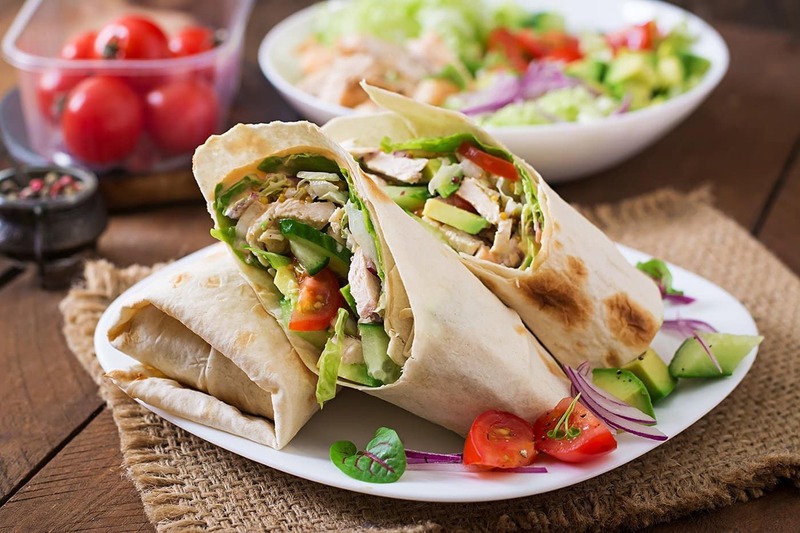 There is so much choice in wrap types that you will enjoy at work! The healthy and delicious box mix will have your mouth water only by looking at it! This easily prepared lunch box will make sure you’re eating the rainbow. Just arrange some carrots, cucumbers, cocktail tomatoes, black olives and yellow peppers in a lunch box. This kind of finger food lunch is super easy to prepare and a mixture of various nutrients. Eat it with some fresh whole grain baguette or rolls, and don’t forget to add two creamy dip variations of your choice for some extra flavor. Delicious duo! I admit, the preparation of this lunch will take a little bit longer indeed but it’s worth it! Cooked vegetables like red pepper or mushrooms offer a lot of useful nutrients for the body and are hard to properly absorb when eaten raw. Small bite size pieces of chicken breast and large pieces of chopped veggies bake superfast in the oven and after 15 minutes your meal is done! Enjoy it with rice or quinoa that you prepare at the same time. If you would like to prepare your drink as well, then you can always opt for a yoghurt lassi. Mix 300ml FitLine Pro·B·4·Yoghurt Drink with 600ml cold water, a pinch of salt and ground cumin. Use 8 ice cubes to make it extra fresh or just store in the fridge. Enjoy it with one of the lunch ideas!